Mark Otten (left) with former student Julian Jordan at one of the writing rooms at STMPD recording studios in Amsterdam. Mark Otten is a DJ/producer who’s released music on a variety of labels, but he’s also know as Martin Garrix’s former music production teacher at the Herman Brood Academy in The Netherlands. 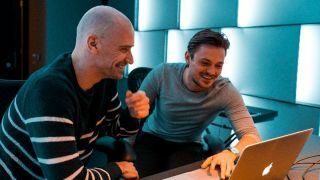 Now seeking to educate the next generation of producers, he’s announced that he’s offering Producer Coaching sessions at the STMPD Studios in Amsterdam. 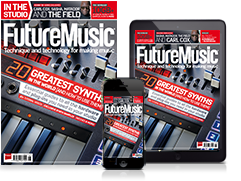 “I call the current generation of new producers 'rule collectors': most of them seem to have a strategy of gathering enough rules for music production in order to obtain great tracks,” says Otten. “I however believe this strategy only works to a certain extent, it doesn't always get you to the level you want and has a tendency of removing spontaneity and personal creativity. “I sense a growing need for personal feedback in order to make the music more real, original and from the heart and part of that will entail un-learning part of these gathered rules." continues Mark. “Besides that, direct feedback could actually turn out to get you results a lot faster than endlessly watching tutorials"
Otten has taught at many of The Netherlands’ music production institutions, including the Haarlem Conservatory, the Rockacademy and the Herman Brood Academy, where he set up the Dance Producer department. As well as Garrix, who once said "I have no clue what I'm doing. I just do some stuff, and if it sounds cool, it's good," other former students include Julian Jordan, Firebeatz, De Sluwe Vos, We Are Loud, Maduk and Pythius. You can find out more and apply on the Producer Coaching website, with prices at starting €250 for a two-hour introductory session if you’re under 21, or €300 if you’re over 21. The most expensive option, which gives you 10 hours of one-to-one coaching spread over five sessions, costs €1,250 for under-21s and €1,500 for over-21s.